Nottingham Tree Services are reliable local Tree Surgeons that specialise in Tree Stump Removal and Tree Stump Grinding at affordable Prices. ​Click here to call Notts Trees. 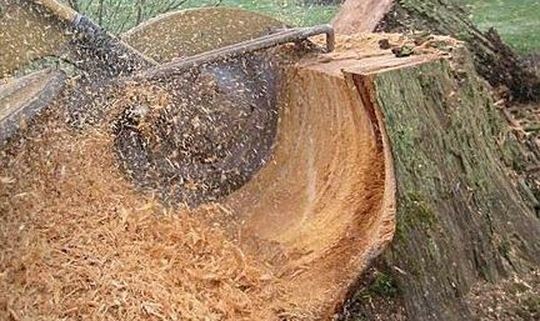 How to get rid of that Unsightly, Potentially Dangerous Stump in Just a few minutes. Instead of it being a grind on you, let us give it a grind it won’t forget! Not only are stumps ugly things, but they can also seriously kill all of the plants and any shrubbery around them if they’re not taken care of properly. The tree surgeons at Nottingham Tree Service are experts in stump removal. We're here to save you the time-consuming task of removing that unsightly stump that you hate from your garden. 1. Basic stump grinding and removal technique. This is done up to 8 inches below the ground with our tree stump grinder. We then grind the root collar completely where roots branch off. That leaves the job of removing the root, root collars and all of the hedging. We’ll then fill in the hole that’s been left so you can have some new grass grow over the land, so it appears that the stump was never there; or even plant a new bush or tree on top. 2. Highly Trained Technicians. The technicians at our Nottingham Tree Service are highly trained in all aspects of removing tree stumps. They take care to ensure that your stump is removed quickly, safely, and effectively so that there is no possibility of any regrowth. 3. Identification of Hazards. Before your stump can be ground down, there are some potential hazards that we need to identify, such as Water, electricity and gas lines. Yes, all of these have been damaged by so-called professionals. Other risks are large rocks, garden lighting and lawn sprinklers to name a few. 4. Fully Licenced. Our tree care service takes pride in the way we handle our services. We are fully licensed, insured and only employ highly skilled and trained tree surgeons, so there will be no cowboys on your property. We guarantee our jobs. That stump isn’t coming back! 5. Don’t make the mistake that many do. It is a common mistake than many make to think that stumps are harmless and that it’s unnecessary to remove them. Stumps that are left behind after the tree has been removed will rot and decay, often becoming infected. This infection can easily spread to nearby trees that are healthy. 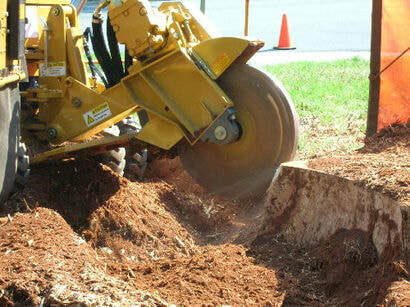 Grinding a stump is by far the least harmful and most professional way of removing a stump from your premises. Not only that, but stump grinding is also the fastest way of removing a stump. All other methods of removal can take anywhere from days up to weeks. To get the professionals in and to find out the stump removal cost associated, simply fill in the form on the right-hand side for a ‘No Hassle Guaranteed’ FREE quote (We Promise). Nottingham Tree Service prides itself in offering the best service at affordable prices. Or call today on on 0115 824 9899 and ask for any special offers that we might be running.